We have observed hundreds of people organizing leagues on PayIt2. Most organizers also use Facebook to organize events and to connect with league members. Many organizers just setup a Facebook event for the start of the league planning. There is actually a better way but it takes a little pre-planning. Follow these simple steps and you will not only be ready to manage this league but you will also setup a way for your members to stay in touch during the season. It will also set you up to manage multiple years. A Facebook Page is not specifically for an event. It is a page on Facebook that League members can ‘like’ to follow in their news feed. When you, your co-captains or league members publish information to the page's wall your league members who liked the page will see the status updates in their new feeds. As a best practice we recommend naming your page with your league’s name. 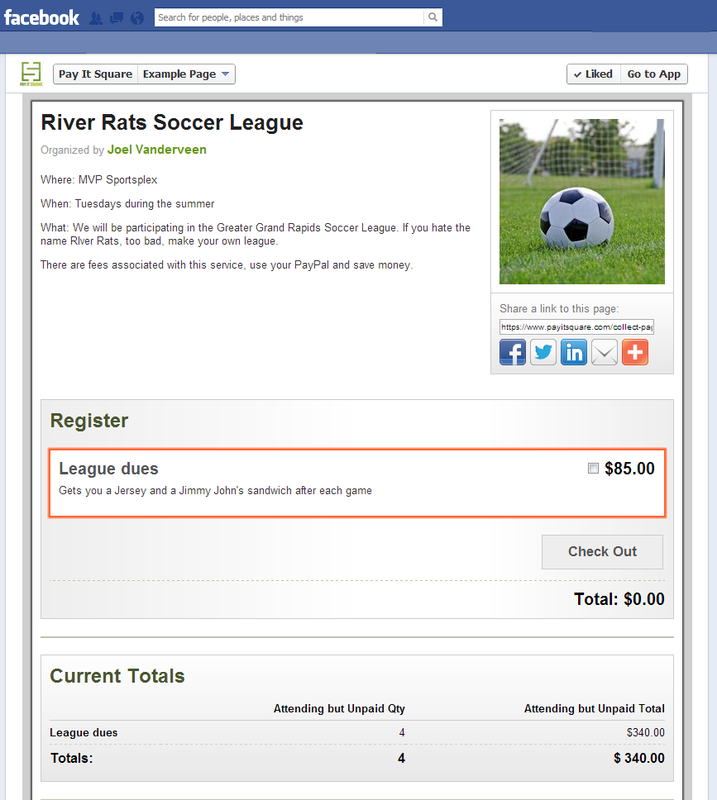 For example: River Rats Soccer (leaving off the year will allow you to use it again). After you have setup your page, add some league members as administrators to help you organize and manage the page. Then promote it to all of your league members and friends and family of the league and ask them to like it so they get updates in their news feeds. Creating an event is easy. The spot to do it is at the top of your League's Facebook page's timeline. Now your season or game event will show up within your league's Facebook Page. People who have liked the page will get an update in their news feed that a season or game has been scheduled. They RSVP to the event as playing or not. You can also share the event with league members directly. Everyone that manages the Facebook page will also be setup to manage the event. In most cases the Facebook Event page isn't enough for a league. Most organizers want to collect money and collect additional information from the each member. They may also want to collect money for extra items like jerseys or food. Those are all the things that a PayIt2 Collect Page helps organizers manage. Setup an event registration Collect Page then go to step 4. Now that you have setup your Collect Page you will want to add it to your league's Facebook Page. It will look something like this when you are done. Finally, if you created a Facebook Event you will want to let people know that they can pay for the event online. Just post a status update to your event's timeline with a link to your league's Facebook Page: Collect Page Tab (now that is a mouthful, but actually really simple). Remember, if you have any questions, we're here to help.